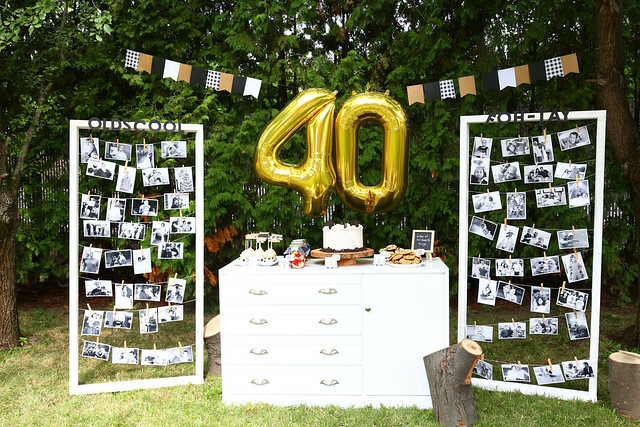 I'm here and on the Lawn Fawn blog today, with pictures from my hubby Amar's 40th birthday. I turned 40 six months ago, and thank goodness he can stop making jokes about being married to an old lady. 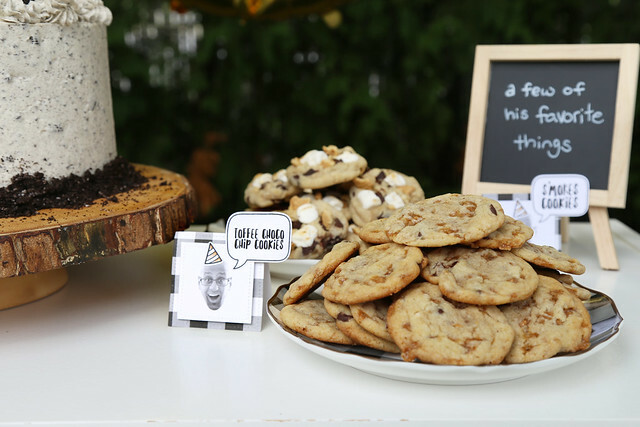 I baked and cooked and made decor for this party, and so I didn't get as many pictures of everything as I had hoped, but I did manage to snap some photos of the dessert table. If you want to know what Lawn Fawn products I used, hop on over to their blog for more of those kinds of details - click! I made Amar build me some simple frames that I painted white to flank the dessert dresser. Really, really simple: just a few 1x3 planks of wood that we nailed together. I think they made the photo display so pretty! 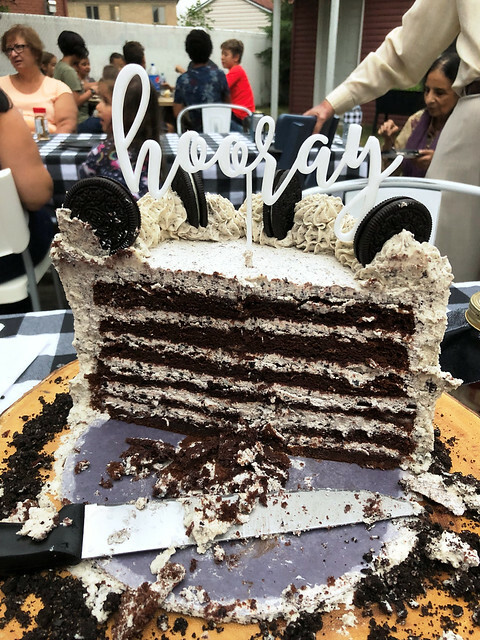 Everything on the table was baked from scratch, including this YUMMY chocolate cake with oreo frosting. I was pretty proud of it! 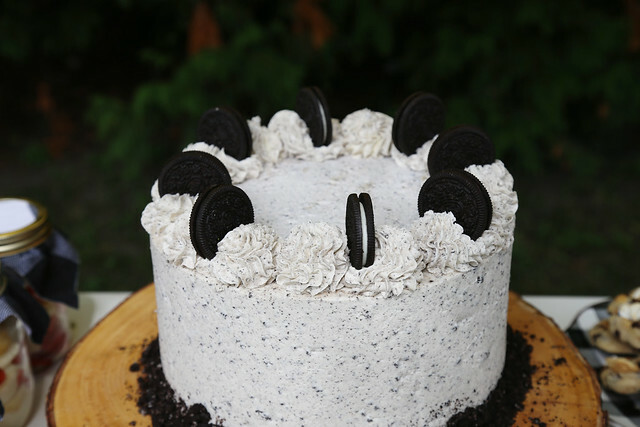 I still have some in the freezer - it was a big cake! I usually bake tiny 6 inch cakes for my party set-ups but we were expecting more than 30 people for a backyard bbq, so I made a 9 inch cake, with I think 6 layers inside. I really tried to bake his favorite desserts. These cupcakes were orange carrot ginger flavored, with a zingy ginger cream cheese frosting on top. 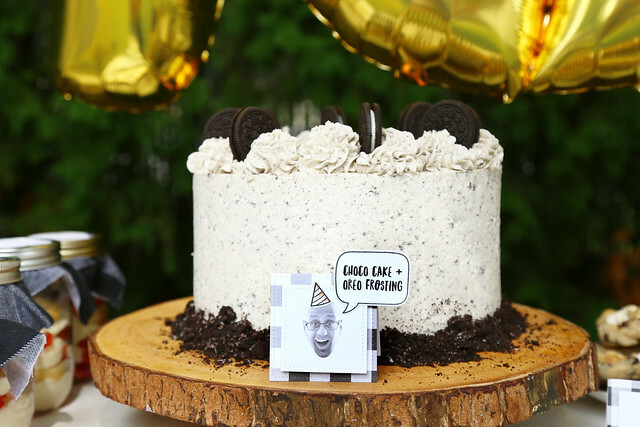 Are you giggling at his face on all of the dessert labels? (cringing? that's ok too, haha.) I found a funny-faced picture of Amar, worked some photoshop magic to erase the background, and printed him out on my home printer. Nothing easier. 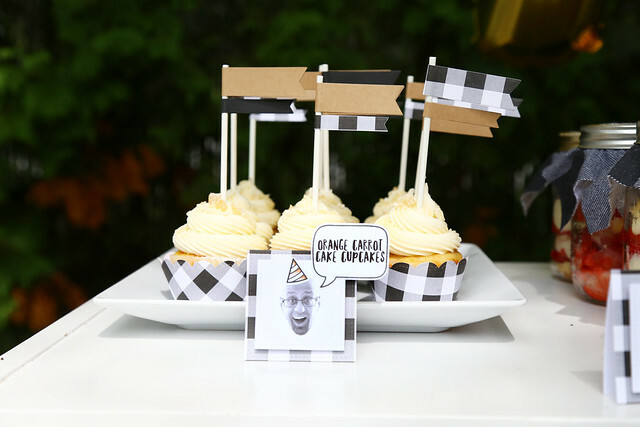 A little stamped party hat and speech bubble were the perfect add-ons. I really wish I had taken photos of the rest of the party - his face was on every water-bottle and dinner food option. No mistaking who's party this was! These brown butter toffee chocolate chip cookies were my favorite. I'll go ahead and share the recipe - click! 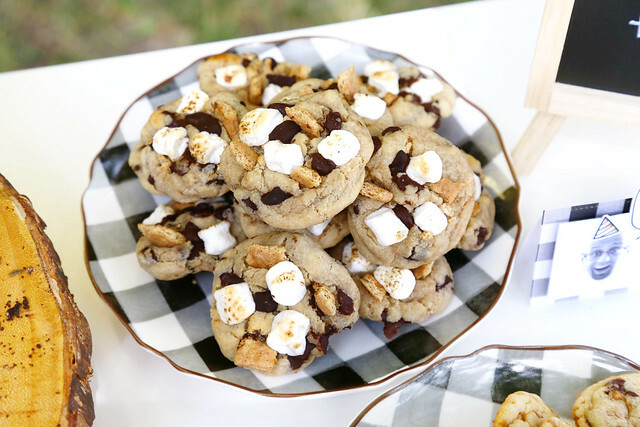 The s'mores cookies were pretty good too. I mean, if you like that sort of thing. 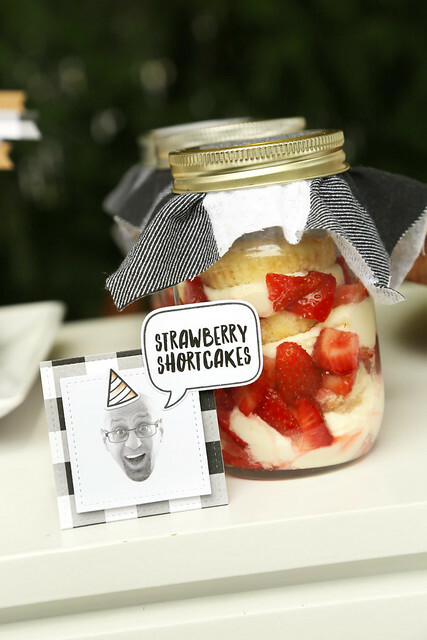 I had some leftover vanilla cupcakes in the freezer, some whipping cream, leftover vanilla cream cheese frosting, strawberries, and an unhealthy paranoia that I wouldn't have enough dessert for everyone (it seemed like a logical stress at the time) so I threw together these mason jar strawberry shortcakes. 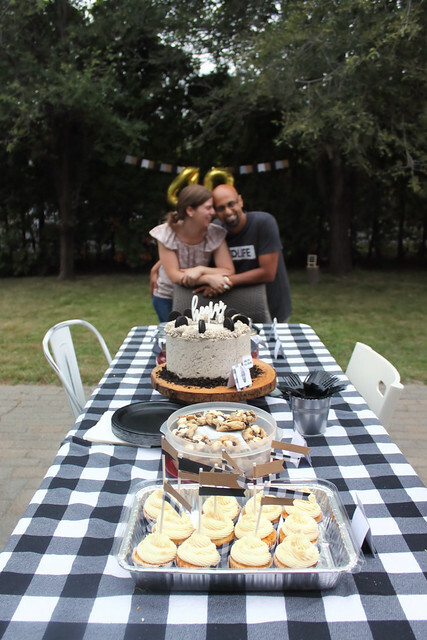 It was such a fun time to celebrate Amar, with all of our family and close friends. It really was a great day! Happy Birthday Amar! I know what it is like to have someone nine months younger, gloating... not for long though. Ha ha.